I had some questions about the long term SPX system in the long term tools section, which I haven't updated for quite a while. Anyway I decided to simplify that system and thus changed it completely. It's now very simple, in fact it only uses 60 and 34 Stochastics, and 14 RSI and 9 EMA - on a weekly chart. It contains no moving average crossovers. All I'm doing is for the primary signals using 34 Stochastic and 60 Stochastic above 50% for longs and below 50% for shorts (however a confirmation is needed - this means that when the 50% level is crossed, another candle must take out the previous candle high or low depending on if it's long or short. I'm using the 14 weekly RSI only when it get's oversold (which rarely happens, and then using a confirmed crossover of the 9 EMA to enter a long - the confirmation works the same way for the 9 EMA as well. You may recall that I showed this method the other day on the daily SPX using 14 RSI and a 9 EMA. The system is Long only, no shorts, it simply exits when there is a sell signal. The times when it is in cash, I assume a modest interest rate gain for those times. buy and hold returned 25 times your money - or $100K turned into $2.5 million. 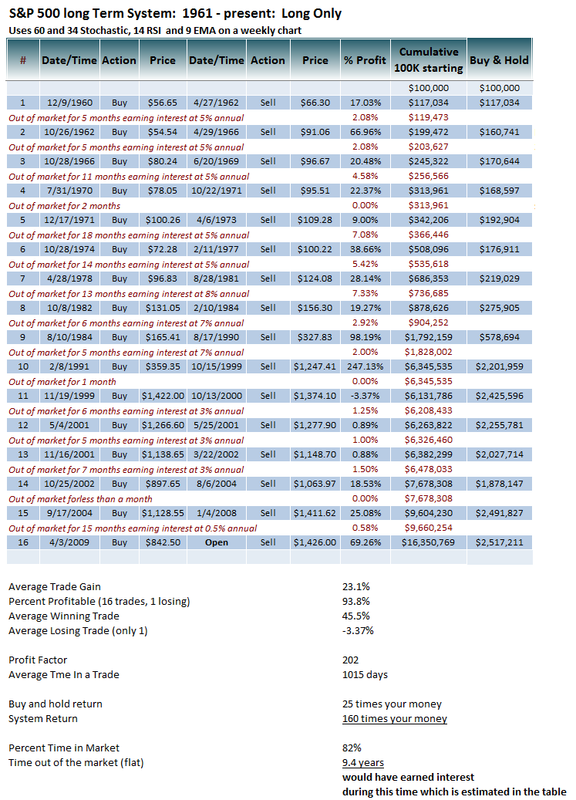 only 18 trades, 17 winning trades (average of 45.5%, one losing trade of -3.37%). again while it is vastly better than buy and hold only, for 99% of us here it is not something that we would trade, average hold time is nearly 3 years, one trade held over 8 years etc. That's why I call it long long term system. Currently the system has been long since 4/3/09 - and isn't really close to giving a an exit signal yet. Again all you have to do is see a weekly SPX chart and look at 34 and 60 Stochastics, they are not close to crossing below 50%. anyway it was a fun exercise just applying simple rules. Now I need to make a daily version with the same rules because the weekly is just too slooooowwww..